Of course, it makes good sense.Some individuals or groups are collaborating as Anonymous and hacking sites containing sensitive data. Earlier this month it launched DDoS attacks against the UK Home Office's website. So of course, it makes sense. 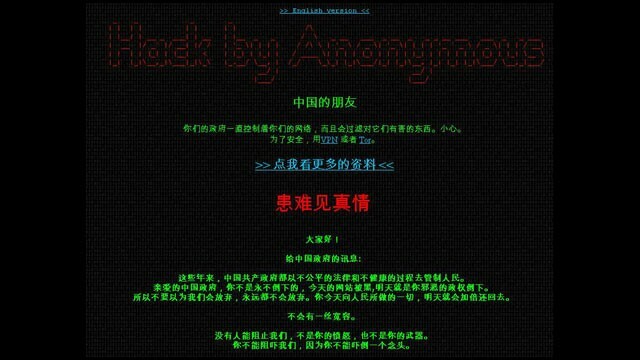 Earlier this month Anonymous launched attacks against Chinese sites. Its "Anonymous China" twitter feed proclaimed, "Dear Chinese government, you are not infallible." And provided those who accessed it information on anti-censorship programmes. So of course it makes sense. The American government has been the main target of Anonymous so its important to stress a new, more malicious enemy. So of course, it makes sense. China's hunger for corporate espionage is harming America, claimed Richard Falkenrath, Former Deputy Homeland Security Advisor to the White House. Right wing conspiracy theorists see the RQ-170 drone lost over Iran as being brought down by a Chinese cyberunit, or more generally, just the Chinese. So of course it make sense. Adam Segal, writing April 20, 2012 in Foreign Policy, argues Anonymous should attack five key Chinese websites. It's not us, it's them, is Segal's tone - China has the really good secrets.